TIMELESS DESIGN: Beautiful kitchen faucet with pull down sprayer in chrome finish. Stunning modern design and made to fit in any home. 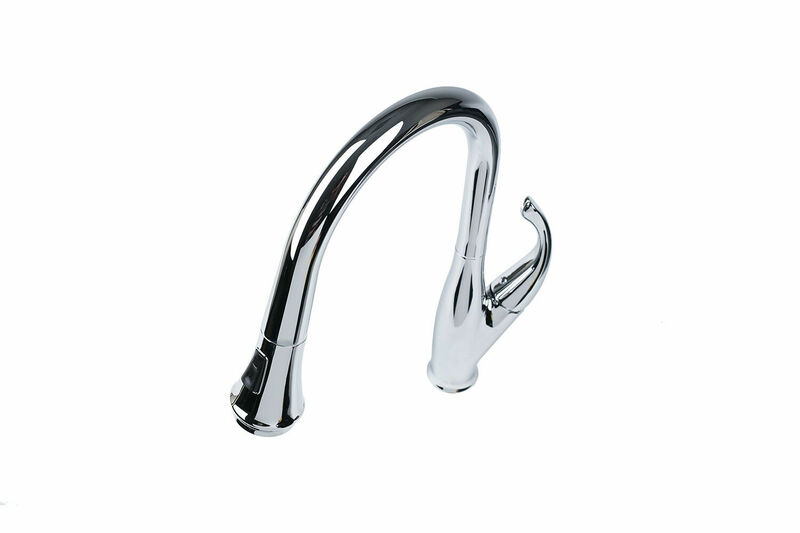 Features high arc neck with easy movement and docking for greater room under the faucet. Elegantly crafted for modern kitchen makeovers and luxury projects. DURABLE & CERTIFIED: Solid brass construction with chrome finish. Uses superior drip free ceramic disc values for longevity and minimal maintenance. Includes stainless steel hose. Product conforms with lead content requirements for “lead-free” plumbing as defined by California, Vermont, Maryland, and Louisiana state laws and the U.S. Safe Drinking Water Act. NSF/ANSI 61 Certified. ADA Compliant. Rated to meet or exceed CALGreen criteria. UPC/cUPC Listed. NO COMPROMISES: Pull out sprayer features push button multi-function sprayer. Effortlessly switch between a strong spray to a gentle stream. Full 360 degree swivel spout for convenience. Self-cleaning rubber nozzles to prevent hard water buildup and clogging.